It’s the time of the year when all over the Internet, critics and amateurs alike are issuing forth proclamations of the year’s best whatever. It’s been an odd year for music, with quite a few artists whose records I would normally look forward to releasing underwhelming albums, and a glance around suggests there’s not much critical consensus over the year’s best releases. That said, there’s been plenty to get excited about, and the lack of any real blockbuster records has allowed plenty of smaller, interesting acts to rise to the surface. So without further ado, here are my selections for the year’s best songs. The best music inspires dancing, and it would seem that not even Thom Yorke can resist the underlying funkiness of this song. The King Of Limbs was a much looser, less formal record than In Rainbows, and many of the tracks have a tendency to sneak into your mind when you least expect it. There’s an infectiousness to “Lotus Flower” that comes from the propelling beat and sparse arrangement, with Yorke’s haunting falsetto laid over the top to disguise the sharper edges of the song. Radiohead might not have pushed the envelope as hard as they do sometimes this year, but they continue to show why they are one of the most important bands around. Cults. Photo provided courtesy of The Windish Agency. 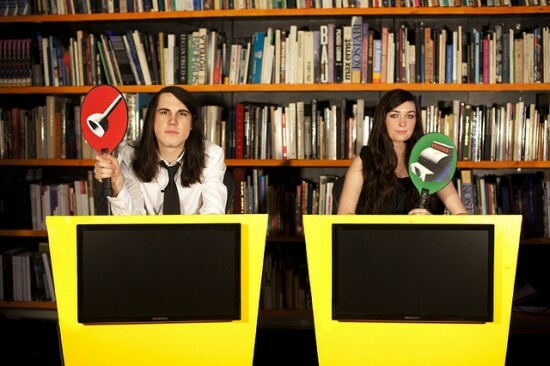 Cults’ eponymous debut album made for perfect summertime listening, and “Bumper” is a wonderful example of the spirit of the record, a blissful, Phil Spector-esque slice of romance built around a female/male duet that hides a thornier truth under the sunny sound. There’s a balancing act to getting a song about an argument to sound as sweet as this without falling into parody, and it’s similar to the equilibrium Cults strike between wearing its ’60s influences on its sleeve and undermining them with flashes of synths, electronica and audio samples of cult leaders. They manage to produce something reassuringly familiar but still unique, and relentlessly replayable to boot. Those Dancing Days went on hiatus this year after releasing its second album, Daydreams and Nightmares, and I count myself very lucky for having caught one of the band’s last shows in London during the summer. Sweden has a knack for producing some of the best pop music in the world, and Those Dancing Days is no exception, with flawless musicianship and hook-laden songs. “I’ll Be Yours” is a perfect piece of heartfelt pop, the warm guitar and Linnea Jönsson’s velvety, Northern Soul-esque voice guiding us into a chorus that packs in the excited energy of a giddy run through a fairground. It’s a song as much about friendship as it is about love, and it feels like every fun moment of the last year compressed into three and a half minutes. It’s easy to root for Nicola Roberts. A member of Girls Aloud, one of the biggest reality show breakouts of recent years (at least in the UK), she was hounded by the press and declared “the ugly one” for being, horror of horrors, pale and ginger. Living under the microscope of the British tabloids for several years, she took advantage of Girls Aloud going on hiatus to make probably the year’s best pop record. The critically acclaimed Cinderella’s Eyes is a fantastic selection of electronica-influenced dancefloor fillers with a deeply personal autobiographical vein running through it, and this, the lead single, shows all that. It fuses dancehall beats, cheerleader chants and Roberts celebrating her newfound confidence, all wrapped around some intensely groovy hooks. It’s been a great year for free music, with more artists than ever willing to put music out for no cost and reap the rewards of an expanded listener base. If someone had told me last year that one of my favorite songs of 2011 would be an icy slice of dark-as-tar R&B that lingers on infidelity and self-destructive hedonism, I would have called him a liar, but the three astonishing EPs put out by The Weeknd for free meant I was willing to take a listen and discover Abel Tesfaye’s fantastic, evocative songwriting and absolutely haunting voice. As soon as it starts playing, it transports you to this far cooler, more dangerous world of skewed morals and seduction, like the best kind of noir film. Like those films, it deals with the addictive nature of the darker side of humanity, and makes for compulsive listening because of it. There’s a level of advanced insanity that is hard to argue against, and it’s that kind of disposition that says “Why not sample Blades Of Glory on this song?” A collaboration between Jay-Z and Kanye West was always going to produce something special, and while Watch The Throne doesn’t reach the heights of last year’s My Beautiful Dark Twisted Fantasy, it’s still a dazzlingly good record, full of insanely quotable lyrics and brilliantly constructed beats. The songs fizz with the energy of two top tier artists letting loose and just having fun, and the album is at its best when Jay and Kanye are at their most gleeful, like on this track. Los Campesinos! Photo provided courtesy of Arts & Crafts. The title track from the band’s fourth album, and one that saw its sound take a leap forward in maturity and complexity, “Hello Sadness” shows off everything that Los Campesinos! does so well; incisive lyrics full of telling details that linger on heartbreak and the raw physicality of love, soaring strings that guide you through the song, elegant arrangements that build to fist-pumping climaxes and chant-filled choruses destined to be screamed as you grip the barriers in front of the stage tight. As always, Gareth Campesinos’ voice conveys the agony, anger, resignation and desperation of love and loss better than any other. Anyone who knows me well knows I love pop songs that take an… unconventional approach to their structure, and on “Countdown,” Beyoncé takes a sledgehammer to a traditional love song and glues it back together with the kinds of musical counting sequences I usually associate with Sesame Street. Conveying the joy and comforts of an existing relationship, rather than one in the flush of new love, is something that all art struggles to carry off, and Beyoncé does it with seeming ease, wrapping up a sweet love story in military drumming, Tijuana brass and a truly impressive vocal performance that skips from rap to harmonies without missing a beat. There is a little known but important metric used when judging great songs: would it sound amazing if I were walking away from an explosion in slow motion? When it comes to this criterion, “Midnight City” beats all others this year. It’s no surprise that the video for the song feels like a movie – it’s an incredibly cinematic song that makes you feel like you could take flight at any moment, powered by the layers of guitars, synths, hushed lyrics and, oh boy, that saxophone. French artists seem to have a knack for producing music that sounds like it’s from the future, and “Midnight City” is no exception. It’s been sent back in time for that moment when you stagger out of a party just as the sun is rising, and everything becomes magical. Terius Nash, AKA The-Dream, put out 1977 for free at the end of August, another example of a fantastic record released for no cost, and it really is a fantastic record. Dwelling on heartbreak and the end of a relationship, Nash covers a huge spectrum of emotions, from melancholy to anger, but is at his best here, painting a picture of a man out of control, at once regretful and hopeful. Nash wears his heart on his sleeve, the simple melody heightening the power of the confessional lyrics and leaving plenty of room for Nash’s incredibly rich voice to carry every ounce of conflict, self-loathing and wounded pride. Laying such a wealth of emotions out there for the listener is a fine line to tread; done poorly, it feels adolescent at best, but done well, as it is here, it’s deeply affecting, and draws you into the song almost instantly. There hasn’t been another song this year that I’ve been so happy to listen to over and over again, losing myself in the almost-hypnotic power of Nash’s voice and the sentiment that it carries. What are your favorite songs released in 2011? Let us know! Follow us on Twitter and like us on Facebook to give us a shout. You can also stay on top of exciting events from around the world by downloading the eventseeker app for iPhone, Android or Windows.